Monday was the one year anniversary of when Mitch Landrieu had New Orleans Fire Department employees steal the Battle of Liberty Place monument. 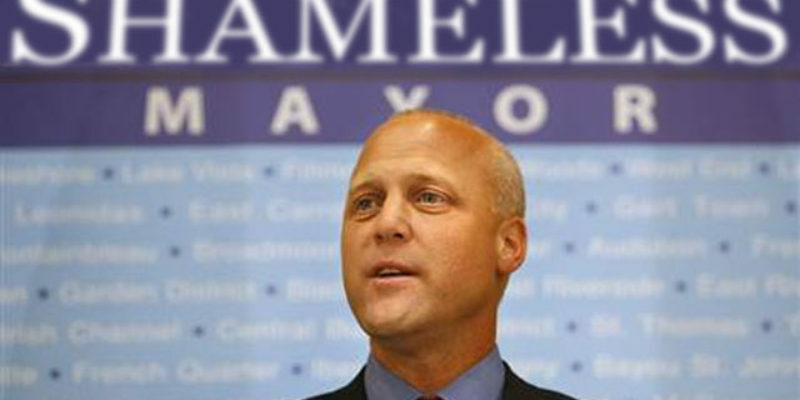 Many citizens firmly feel Mitch Landrieu is the worst mayor New Orleans has had in its 300 years. Mitch has been grandstanding since May 19, 2017 about all the good he has done for New Orleans with his highly controversial, self-serving monument removal campaign. The reality is that he grossly neglected New Orleans while on his anti-intellectual crusade. Mitch spent three of his eight years as mayor emphatically stating that four historic monuments are a major problem in New Orleans. No, Mr. Mayor, monuments are not the problem. They are not murder, they are not racism, they are not a burning cross, and they should never have taken up a majority of your focus. Stop going on national television or local or even into dining rooms and talking about monuments. You have been mayor for 8 years. You have been in control of the city. And you leave it in shambles. Monuments did not deplete the NOPD. Monuments did not neglect their role as S&WB President. Monuments did not neglect their role as mayor of the city of New Orleans. Monuments do not say Lee doesn’t belong in New Aw-LEE-enz as you pronounce it, ironically emphasizing Lee’s name while saying “Orleans” like a tourist. Monuments did not have three turbines out of service two weeks after a major flood, causing another major flood. Monuments did not waste millions refurbishing a 50 year old turbine instead of replacing it. Monuments did not ignore Turbine No. 4 being out of service since 2012. Monuments did not choose to stay at a conference in Aspen for a speech while New Orleans flooded. Monuments did not go on TV while the fifth of sixth turbines failed and the city’s water was not drinkable. Monuments did not say global warming caused flooding to cover up for Sewerage & Water Board neglect. Monuments did not issue a half dozen boil water advisories like a major city is a third world. Monuments did not steal Mardi Gras ladders without warning along the parade route. Monuments didn’t spend the admitted amount of $2.1m to remove historic landmarks. Monuments did not use taxpayer money to spy on New Orleanians. Monuments were not afraid to go to a murder scene and thus rerouted a press conference to a University Hospital. Monuments did not lie about a fire at a pump station. Monuments did not receive tax exempt status on their own parking lots. Monuments did not use government influence to improve a section of the city in immediate vicinity to their own property. Monuments do not keep robbing businesses. Monuments do not keep killing people. Monuments do not keep assaulting French Quarter tourists. Monuments are not so out of touch with reality as to not even realize how bad the quality of life has sunk in New Orleans. Monument did not spend $15 million refurbishing a building for slave owner James Gallier. Monuments did not show reverence for Louisiana’s most famous slave trafficker by spending $9.1 million on a bike path honoring Jean Lafitte. Monuments did not vote in favor of Confederate license plates in Louisiana. Monuments did not evade public transparency by funneling money through private non-profits. Monuments did not raise taxes. Monuments did not try to install a curfew on Bourbon Street. Monuments did not try to sell off the Public Belt railroad. Monuments did not sell a city street for nothing. Monuments did not leave the Municipal Auditorium decaying in neglect. Monuments did not increase parking fees and fines while owning parking lots. Monuments do not wildly give out parking tickets. Monuments did not have their cousin’s new start up concrete business get contract work all over the city. Monuments are not using the slogan “Preserving The Past” after removing century old landmarks. Monuments did not put up traffic cameras as a money grab. Monuments did not oversee a city that saw the Saints-great Will Smith gunned down, a Tulane Medical student shot on camera, more than a dozen people shot during a Mother’s Day celebration, and multiple Bourbon Street shootings. Monuments did not make the sinkhole in Poydras. Monuments did not ignore clogged catch basins as S&WB President. Monuments did not skip S&WB meetings for 4 years while serving as S&WB President. Monuments did not start a PAC then travel the country while New Orleans falls apart. Monuments did not write a book while the city fell apart. Monuments did not narrate the audio version of their book. Monuments did not write a book on historic topics without one reference citation. Monuments did not go on a national book tour while employed by by the taxpayers as mayor. Monuments did not neglect the decrepit streets of New Orleans for 8 years. Monuments did not prioritize monuments over true needs of the city. Monuments did not divide New Orleans. Monuments did not dive in front of TV cameras while New Orleans decayed. No, Mayor Landrieu, monuments did not do any of the above, it was all you. Mitch Landrieu will live on in the history books as New Orleans’ most hated along with Benjamin “Beast” Butler and Alejandro “Bloody” O’Reilly. The bumper stickers around town that say “Mitch Landrieu- Worst. Mayor. Ever.” nailed it. Honk when you see them because Mitch is the absolute worst. Mayor. Ever.